Yet another revival, A Delicate Balance, has opened on Broadway. 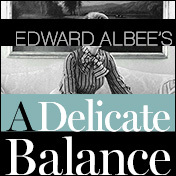 This Pulitzer Prize winning play, written by Edward Albee in 1967, is well-written but hasn’t aged well. Agnes, the “CEO” of the family is a career housewife and runs a tight household. She lives in a large, beautifully appointed home with her retired husband Tobias, their servants, and Agnes’s alcoholic sister Claire. Claire makes it her business to push her sister’s and brother-in-law’s buttons whenever she can. You can sense that there are family dramas and sadness that simmer just below the surface, but the three have achieved a “delicate balance”. That is until Julia (Agnes and Tobias’s daughter) comes home licking the wounds of a failed fourth marriage. Also thrown into the mix are Agnes and Tobias’s best friends who join them when they find themselves feeling an unexplained “terror” in their own house. The equilibrium that had been achieved is thrown off kilter and everyone is forced to evaluate one another and themselves.